Pamela + Sarah - 2015 EnGAYged Wedding EXPO Giveaway Finalists! 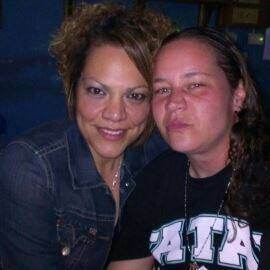 My name is Pamela on the right I'm 35yrs old and my soon to be wife one day her name is Sarah she is 37yrs old. We have been together for a year and I must say we for sure have found the "ONE" in each other. She was a single mother of 5 and she found me and I have been in love ever since. We have been through a lot in a year of families disowning us and a lot of trials and our love for one another prevails every time and gets stronger everyday. I would love for her to actually have a wedding one that she would remember for the rest of her life. I came from a very bad home life growing up and have never been on a trip or anywhere nice. And I would love to actually be able to and have a new start and a do over and would love to do that with the love of my life and my future wife!! I've never been married and it's because I have been waiting all my life for her and she has found me and just can't afford to because we work hard everyday to make it and support our family. One day it will be whole and same last name the right way.